Avenue Campus is the smaller of the University of Northampton’s two campuses that will eventually close following the University’s relocation to its new Waterside Campus in the town centre. 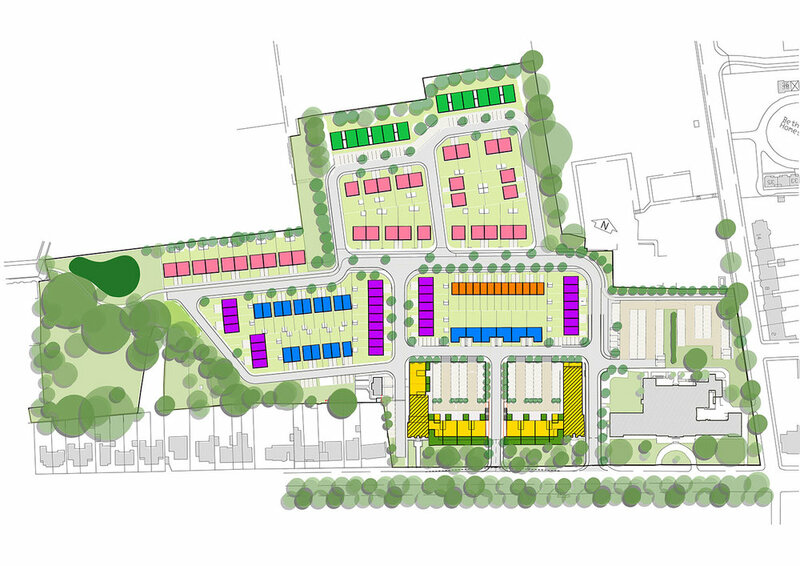 As part of a coordinated planning strategy MCW were appointed to masterplan and lead an Outline Planning Application for a 200-unit residential development to secure a value for a future sale of the campus. The exiting campus presented a number of challenges including listed buildings, steep topography, highways connectivity and protected green space. MCW’s illustrative masterplan proposed the creation of a new ‘urban quad’ integrating retained parts of the listed building and a new ‘street’ to provide wider connectivity to the adjacent community. The retained existing landscape space was enhanced by new green infrastructure and a SUDS scheme that helped establish a clear sense of place and improve the ecological diversity of the site. In addition to the masterplan, MCW were appointed to jointly develop a detailed planning application for the replacement of a 1960’s building on the front of the site, facing the Old Racecourse, with a 50-bed residential terrace. The contemporary design closely referenced the principles of the surrounding architecture in the area and carefully crafted the integration of the retained listed ‘pavilions’.